Welcome to the e-commerce marketing Partners today’s guest is Sam Boyd and his from guided Imports welcome to the podcast on how you doing. Thank you so much Robert. I’m great. Thank you so today. We are going to be talking about sourcing from China. This is like some. Hot Trend that’s going on right now a lot of businesses getting into selling on Amazon, and you know it’s just something. That’s really hard. 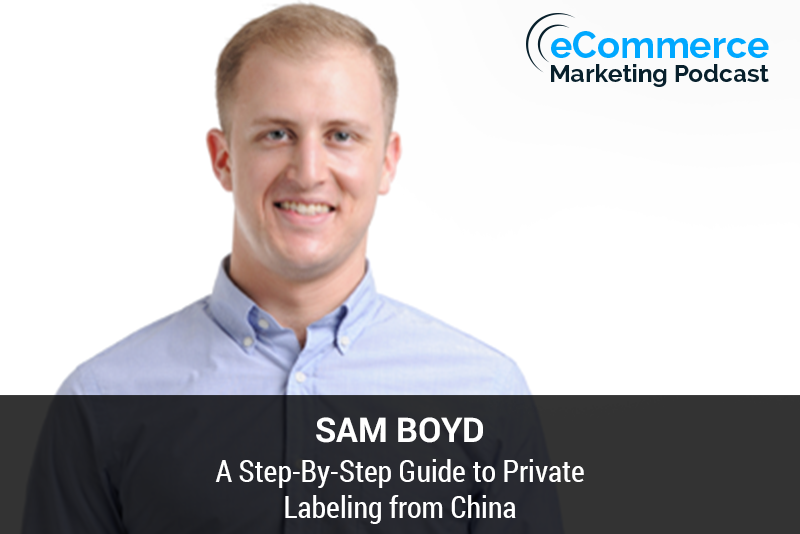 That’s really happening and don’t it to have you on because you’re the go-to guy as far as private labeling and sourcing from China, but before we get into the topic. Why don’t you just let us know about yourself, and how you ended up doing what you do right now. Yeah, definitely um so I have been dealing with China. I guess since 2008. I studied Chinese and University I done business there prior to moving here once. I got to China. I started working for a product development company. I enjoyed it, but I didn’t like the idea of having a boss so at once I learned the ins and outs of international trade. I started my own started my own sourcing business which was helping customers get products. From factories in China, and we would get them shipped to retail stores and some eCommerce stores, okay, so we sort of grew from there. I helped a lot of e-commerce sellers, but that’s basically the gist of what it is that I do, and you know we’ve been able to grow us a pretty decent size Team all operating out of China, and you know I guess I love and every second of it, okay, and do you walk on Tuesday serve like where some of you? Customers from my babe from around the world or do you just focus on the US Canada UK right so a lot of our customers are are selling in North America that seems to be the the most popular market and we cater now with guided Imports we cater. Towards private label Sellers and also e-commerce sellers so the since the biggest Market is the us a lot of people are selling in the us, but we also export goods to to Europe the Middle East and also, Australia, and then we from that we have customers all over the world, so we are you know we do have a reaches sort of almost everywhere, okay, and what exactly is your thumb is what do you do for your customer? Yes, so what we do is we’re sourcing company, but we sort of handle it in a different fashion than how original sourcing companies are traditional sourcing companies work where they help people find products. They take a small commission or they take a percentage of some sort and they act as a middleman so this model works very well with retail sales or people are doing tens of thousands or hundreds of thousands dollars worth of orders. But when you look at Ecommerce the order size is much smaller because the the the sale is so much more Surgical and because of that that this commission based modeling doesn’t work so we offer a service where we take over all aspects of dealing dealing with China on behalf of our customers. We use our feet on the ground as the Purchasing Office. And we we act as as the purchasing team for our customers dealing with factories finding factories negotiating managing shipping, so essentially we are an extra employee for for companies who are selling products on Amazon getting them manufactured in China or selling them on Race on e-commerce and where they’re getting manufactured in China OK and from your experience. What a sound I guess now. We’re going to get in. To the topic of sourcing from China, but what what are the common mistakes that you’ve seen online as far as advice or a lot of people are talking about sourcing from China, but maybe they don’t get into everything. Maybe they don’t mention some common pitfalls, so they probably just talk about Okie Chinese great Chinese great. It’s going to increase your your margin, and you can get inventory from them, but. Are they really not saying China is a beast I mean all in itself. It’s it’s the largest country in the world their output is huge in their business practices are so much different than anywhere else in the entire world. It’s exciting especially with e-commerce booming right now and also Amazon being being this this huge elephant where anyone can get onto Amazon and start start their own small business and because Amazon is so exciting a lot of. Look at this as an opportunity that anyone can can make millions doing this and one of the one of the immediate things that I try to explain to two people who are who are new to sourcing from China or new to selling on Amazon or bring their products in the e-commerce is this isn’t a get-rich-quick scheme dealing with China is it is difficult. It’s not easy. There’s a lot to learn and while it can be exciting to read. These incredible case studies. Where people are are doing millions of dollars worth of Revenue every year by just sitting behind their computer and sipping Mai Tais. There’s a there’s a lot more to learn and understand about China and without doing that before moving forward and looking towards this place as a as a location for Offshore Manufacturing you could run into some serious difficulties, so I think that’s one of the. Initial things I like to point out to people especially when they’re a beginner and they have no idea how to start or where to go. That’s one of the that’s one of the early things that we like to we like to explain the people that that you truly need to respect so yeah like many of the beginners when they get into it. They’ve probably had one of those case studies, and they excited that oh. Hey, maybe this is one way. I can I can make money can get rich really quickly. I can just retire and then you know move to a private island, but it’s it’s not that it’s just like everything else you really do have to put in your time to get whatever profit or rewards are going after yeah, I think you’re right and when when I try to explain how difficult China is you know we start with the analogy where in getting a product manufactured in China. It’s not as simple as just going to a deli ordering a sandwich. It’s also not as simple. Was going to a bakery or baking a cake from scratch? It’s it’s it’s it’s almost equivalent to baking have been being asked to bake a cake from scratch, but not knowing any of the ingredients that are inside of the cake and you have to go and find all of these ingredients and start testing figuring out how to I make this cake and because of the the business being so different. It is necessary for people who are interested in this to start doing some. Research reading about it. There’s tons of information. That’s free online that that you can that you can look into there’s blogs. There’s there’s videos. Yeah, go ahead. Sorry. Yeah, so I was going to say when the variety done the research and then they’re ready to jump in I guess the first step is trying to find suppliers and manufacturers. Yeah, definitely, so there’s tons of suppliers in China. There’s there’s tons of factories, and if you have an idea of a product to you. Or you’re currently selling a product, and you’d like to see if you can get it directly from the source you can hop on the Alibaba or Global Sources and start finding factories that are making this exact product now the most important thing in this and this will sort of jump into do little bit of fast-forwarding and assume that people understand China they understand. How to find suppliers how to use Global Sources to speak with suppliers, so what are the things that you really need to look out for when you’re when you’re speaking with these suppliers and some of the some of the the key things that that I like to I like to make sure that people understand is when you’re looking for suppliers the very last thing you want to be looking at is price price is a dangerous vehicle when everything that you’re doing is is guided purely by the price. Because of how volatile suppliers are in China so once you take price out of it you then want to try to be as selective as possible when you’re looking for suppliers because when you search for when you search for factories. You’re going to see tons of them and you want to be able to find the ones who communicate well who present themselves as legitimate as legitimate companies and provide the necessary amount of information about the product that you’re interested in purchasing. And while a lot of people when they first start out doing this or even after they doing this for awhile when they start speaking with factories. They get very excited and almost they almost feel as though. They need to show off to these factories. They need to make them think oh where this big buyer almost overcompensating because they know in reality they’ve been able to create their own business behind their computer. They want to make it seem like they have a giant company where in reality that’s not really necessary. Write what you want to be focusing on is having these suppliers validate themselves to you do they do they have the do they have the amount of experience to they have the amount of understanding and certainly can they produce the products that you’re looking you’re looking to get made at the level that that your customers require, so this is this is really the one of the first steps into dealing with suppliers and while we’ll see a lot of guides. Tell us okay. Here are so here are five tips for finding a qualified supplier the true Focus for for anyone who’s dealing with with China is to come up with your own solution as to what makes a supplier qualified for your company and for some people that will be they accept alibaba’s trade Assurance, which is like escrow or they have phenomenal pictures on their website for people like like us when we’re sourcing products for suppliers. We’re looking at. Our business contracts we’re looking at making sure that they are businesses are fully licensed that they have proper certifications that their certifications are real. It’s super easy to fake certifications, so we want to make sure that they’re actually legitimate certifications. We want to see are they producing these products in the same market and do are their existing happy customers, so. A lot of times people think well I’m not going to ask China for references because maybe they’re not going to give them to me. Well. You know if you want to work with a new accountant you’re going to ask them for a references if you’re going to work with a factory you should ask them for references as well sometimes. They’ll give them to you which is good if they don’t want to give them to you that could be considered a red flag. So building yourself this this list of of key reasons to qualify and disqualify its supplier is really what’s going to make the year sourcing process and finding good factories simple and what about the language barrier is that language barrier or a lot of these manufacturers and suppliers are a lot of them today have an English-speaking team or how do you like just find somebody? If you don’t know its ideas, or you don’t have a translator, how does that layout? Yes, so for the most part everyone who you will find on these the supplier database websites will speak English to some regard it’s kind of funny on I’ve brought some clients over to China and and had the meet some of the suppliers or we go to different trade fairs, and when we’re both speaking English when I speak to the suppliers and when the client speaks. Supplier the suppliers are always able to understand me where they sometimes have a difficult time understanding the client and the reason because the reason for this is I simplify everything and it’s it’s important to know that when you are speaking with what these. With these Chinese people who English is not their first language taking away all of the all types of complex words or any any any any form of speech that would confuse a fourth grader you want to take that out and speak clearly and clearly and slowly. And they should be fine, it usually communication is only an issue once you start negotiating and once you start once you start changing your product requirements, but there are certain things that you can always do to make sure that while if communication is isn’t difficult as a difficult thing to overcome with one supplier. There are tricks that you can use when you’re purchasing to make sure that they fully understand that breathing. Okay, and once it go through the whole database and you find the supplier that you want to use for your product. How do you ensure that they that they will be producing great products? How can you have quality control? Yeah, that’s a great question, and I it’s it’s probably as e-commerce is growing and more and more people are looking at China the largest concern. We’re seeing lately is this quality control. Cuz every single person who touches your product. Has the opportunity to publish something about that product about your product on your site or on online and it’s going to stay there forever never there was there’s never been a time in retail where every single customer has been able to listen to every other customers concerns or feedback prior to e-commerce with quality control being the biggest one anyone whose purchasing from China One. Of the most important things that you need to factor into every single shipment. We’re not talking every other shipment, or we’re not talking every first shipment is to have quality control you want to have a third-party Quality Inspection company go to your go to the factory during the production to inspect the goods. This is something that can’t be avoided this. This is something that many people choose to neglect but by having a non partial third-party third-party inspector. To a factory to inspect the goods and to provide them inspection report noting that there’s no there’s no other. There’s no other way for you to for you to feel comfortable knowing that the supplier produced exactly what it was you were looking for unless you do something like this because a factory is always going to say yeah, the products are fine. We quality can we did quality control on them, and we didn’t find that there’s no problem of course. They’re going to say that because they want you to they want you to spend all your money. And it it’s it’s in their best interest for the order to go smoothly so quality control 100% all the time. It’s it’s around $300 per order you can use all types of companies. You can just do a quick Google search to find these guys and it can it can end up saving you thousands, and do you tell this third party company their requirements that you want the product to meet do let them know ahead of time that. The specifications on this product to have this to meet these requirements. Yeah absolutely, so it’s one of the one of the more important things, and that’s why fully understanding your product is also important. Fully understanding. Where are the weak points in your product if you got multiple samples for multiple suppliers where. Or people screwing up where it what is there a part in your product that uses paint and sometimes the paint was chipping, or was there stitching that sort of that needs to you need to ensure that the stitching is strong and straight so all of this stuff is what you want to have have ready, so you can talk to your quality controller, and you can tell them that this is what we want you looking out for these are some of the things that we saw as weaknesses in the product. And we want you to make sure that that these are checked also. This is how the product should look so if you’re having bouncy balls manufactured you want to make sure that it’s it’s it’s a perfect sphere. There’s no there’s no seams where the the the silicone the silicone shows that it was it was used to make a mold it needs to it needs to bounce like it’s it’s it’s going over with this quality controller. How the product is supposed to work. What what it’s supposed. Look like what it’s supposed to do so they can then use that information when they go to the factories, and I want to point out because a lot of people who are new to this don’t don’t fully understand. How quality control works almost every single quality control inspector is not going to test of your products. It’s not practical. There’s too many products when people are doing orders of thousands or tens of thousands of products. There’s too many to check so what they do is they do statistical sampling during World. Or to the US government US military produced a they produced a document that basically it’s called the accepted quality limit for manufacturing, and they say that if if we want if we want to manufacture 10,000 units of something and we want the quality to reach to reach X standard. This is the this is the percentage that we that an inspector needs to check to ensure that that percentage is met. Is what called inspectors do today? They do they do statistical sampling on the products? So it’s important for an e-commerce seller to understand that when you’re using these these inspectors. They’re not going to be looking at every every single product. There are going to be defects. That’s one of the most difficult things in the Commerce right now is how do we solve this solution of getting rid of all the defects because when one person gets a defect people are going to complain. They’re going to they’re going to talk about it, so while quality. Was important there it should always be known that that they’re trying to find the lowest amount of defects possible. And that means that there still will be some but to get it to the to get your production where there’s zero. It’s often going to turn out to be more costly than than producing in China. Okay, so yeah that is definitely something that good to have in mind as you look into sourcing from China. We payment. I I in your notes you mentioned that you shouldn’t pay the cell as using PayPal. Why is this something that people should avoid yeah, I think as I think is as most of your listeners would agree PayPal. It is commonly used for all types of. Commerce transactions, so it’s it’s it only makes sense to use PayPal when you’re when you’re paying factories. I tell everyone that PayPal is a bad idea the reason why is it’s expensive when you’re dealing with factories your ears you’re sending them thousands of dollars the the processing fees alone, which the factory is will say that you’re responsible for if you want to use PayPal are 3% 4%. These are these are really high fees when you’re looking at thousands of dollars worth of orders so from a cost perspective alone. It’s expensive PayPal. Also doesn’t their their terms. Don’t don’t offer protection for customized products made out of China private labeled products. It’s so when people think well if I use PayPal as a safety net so it worst case scenario is I follow a dispute and get my money back there. They’re not really going to get protect protection and the most dangerous part about that mentality is if you’re realize if you’re utilizing PayPal to be your safety net to be your if all else fails. I’ll dispute the claim on PayPal then you’ve done a very bad job sourcing the supplier because your goal when your sourcing us a. Fire is to find the support that is qualified to do that is qualified to do business with you and that one of those things means being able to send them money under under an agreement of from from two different countries, and you’re confident that they’re going to produce produce the goods that you’ve requested and finally PayPal PayPal is not the way this industry works as as exciting as China is for a lot of people who are looking to or are already. There this is an incredibly old industry. It is its outdated and its complex and most people when you’re when you’re dealing with International Trade. They like to stick to the to the the Traditions that have always been done and by trying to use something as amateurish as PayPal it tags. You as as someone. Who’s naive in the service and this industry, and there’s a good chance that. I will mean that you could easily be taken advantage of okay, so yeah bill. Just know how your new so if yeah exactly, so I guess the final question is so how do we how do you pay them and traditionally what you want to do is a wire transfer only go to your bank and ask to do it an international wire transfer usually with factories the way they they work things. You’ll pay a small deposit up front. It’s usually 30% of the production and then once the goods are complete and your Quality Inspector has tested the goods and your inspection report has come back and have as a passing grade, then you can pay the final the final deposit to get the goods released. It definitely makes sense PayPal comes consum convenient especially coming from the e-commerce world you handled some payments from PayPal so you. Kind of makes sense oh, it’s it’s really convenient, but when you’re dealing with these suppliers. It’s definitely best just to use the wire transfer because even when you’re doing when you’re watching and handling other payments or substance that you do for your business not all of them you you you do with paper. You only do paper for the most convenient easy or. You know small ticket transactions exactly small amounts, but something like this a wire transfer and yours to protected because you just given thirty percent discount, and then you make the full payment once everything has been done. Yeah, and it’s also important to understand that there’s no risk-free way to deal with China and there. There is a risk in dealing with China. It’s it’s an inexpensive solution for a lot of businesses, but it’s not perfect and I mean when you when you look at the company like like ours. We where we offer a solution to take over all aspects of importing from China and Manufacturing China. We also tell our customers that that we’re not guaranteeing nothing is going to go wrong. We’re not promising you that that with us on your side. This process is going to is going to be without a doubt bulletproof. That’s not necessarily what we do what we try to do is is we try to explain that we’ve made a lot of mistakes in the past and there’s. A lot of mistakes that that could be made and the the the processes of how we do business the processes of how we work with factories. We do so in a way that mitigates those those risks and and and brings them down to two a very to a very low percent so while. I would I would confidently say you have less risk using us there still is risk regardless of what happens when you’re dealing with China. Whether it is payments or whether it’s doing quality control or even finding a qualified supplier things happen things always do happen. We’re sort of here. Just to make sure everything is done. So those bad things have a very very little chance of happening and for the people who are afraid like they don’t like how that. Sounds it’s a it’s usually a good. It’s a good determining factor to tell you that may be purchasing from China is not right for you, and it would be more ideal for you to continue purchasing domestically or from another country and how can listeners find you if they want to use yourself as if they have questions about sauce in what’s the best place to get in contact with you? Yes, you can always get in contact me contact with me through our. I which is guided Imports you can email us at info at guided Imports com unusually I’m usually pretty responsive when it comes to inbound emails. I’m usually the first one that likes to likes to likes to talk to customers and figure out if our service is good for them, and you know apart from that you can also find me on Facebook. I’m on the couple groups. We have our own Facebook group, so there’s there’s a couple places where you’ll be able to find me. I’m pretty and pretty accessible any final. Out on what we’ve covered with sourcing from China. I was I’d probably just like to say for those. Who are new look into it do some research try to do one one production on your own to see what it’s like don’t expect to make a lot of money, but just get the experience of dealing with China for those who who are Cirque currently purchasing from China, and you’re looking for a way to streamline your business to to allow. Service to take over all aspects while you stay in the loop in in in its entirety. We could definitely be a solution for that or you know you can always look at look at all different types of sourcing Services. They’re definitely all there to help you the last question. I usually ask for the podcast is what is one thing an e-commerce business can do right now to help them. Grow get traffic get leads just achieve their goals. What advice would you give any e-commerce business and what action should they take right now to help them be a step closer to their goals so while I’m probably not the best person to give advice from out from a marketing standpoint. I can hopefully give advice from e-commerce. Product Improvement perspective, and if you’re selling products currently that are getting reviews that are are less than less than perfect that means that there’s always room for improvement and by working with China whether it’s working with a new Factory, then you currently have changing the way your current factory is operating or coming to China from your existing Source being able to change those reviews by modifying your product. Is is a very helpful way to to show people that not only growing, but you’re listening to what they’re saying and by using China you can always tweak your products you can always make them better. You can always look for rooms of improvement and your customers your reviews are the best place to find that information. Okay, so thanks for being on the e-commerce marketing podcast. Thank you so much Robert. I appreciate it. Thank you for listening to the e-commerce. Importers join the e-commerce marketing podcast Facebook group to learn connect collaborate and grow with other e-commerce marketers at e-commerce marketing podcast for FB e-commerce marketing podcast for FB subscribe to us on iTunes by searching for e-commerce marketing podcast and please leave a rating and the review.